"Rather than seeking among our opponents for strategic allies, it would be much better to seek a principled alliance across the left to create a strong center of gravity from which to fight both the center and the right." "Don't normalize it" and "Don't be hysterical": These are the two alternating commands that we on the left see in our social media feeds every day. Each side, catching sight of the other, then spends the rest of the day castigating the other side for moral idiocy or hysterical stupidity. Trying to be neither a moral idiot nor a hysterical reactionary, I want to take a historical look at this debate about how to respond to Trumpism. I don't mean the recent history of the 2016 presidential campaign, nor the more distant history of Nazism in the 1930s. Instead, I trace much of the American left's strategic conflict over responding to Trumpism to the first era of post 9/11 mobilization. Even then, the American left had become so fragmented that we relied almost entirely on strategic alliances with other political forces that we might acknowledge as "lesser evils" but which we perceived as more powerful than closer potential allies. Rather than pushing the left to the front of American politics, this history of strategic alliances has made it more difficult for different parts of the left to talk to each other to build an actual left strategy, as each side now believes that the other is allied with the side that is not the lesser, but the greater evil. Here's how I think it happened. Most of us on the left are familiar with one narrative of the bad consequences of strategic alliances with the lesser evil. The story of the failure of the Democratic Party to represent the aims of the left is one that most of us could recite in our sleep. Instructed by years of experience, many on the left perceive the Democratic Party to be much like Charles Schulz's Lucy, offering to hold the football for Charlie Brown's running kick. That is, at one point on the way to political maturity, many of us may have been excited about the left argument for backing a particular Democratic Party candidate, only to find ourselves flat on our backs when those people pursued terrible policy agendas once elected. Long term consequences of such alliances for the left have been devastating, funneling emerging social movements into campaigns to elect politicians who betray left agendas. Even worse, despite arguing that a left movement will push these candidates to go further left, the broader left orbit of progressives generally refuse to seriously challenge Democratic Party politicians out of fear that any protest against Democrats will aid the Republican Party. As I see it today, those leftists who argue that the Trump-Russia investigation as simply a Democratic Party strategy to avoid taking responsibility for their loss of the election to Trump is flawed by a myopic emphasis on these past experiences. Keeping the story of the 2016 primaries at the center of the field of vision, they don't see the significant disruptions in US centers of power forged by the simultaneous growth in domestic white-supremacist populism and the international effort by Russia to create a Eurasian power-bloc against NATO. The implication of the argument is that the political center is currently more dangerous than the far right. The assumption is that the far right is small and the center-right predictable. However, the radical conservative movements that led to the Trump presidency have opened up a fault line within the Republican Party that casual observers on the left rarely care to parse. Even as we on the left warn our progressive friends not to overstate differences among right wing factions to the extent that they shout "Welcome to the Resistance!" to each mainstream GOP activist who breaks momentarily with Trump, we should understand where and how such breaks occur, and what they may mean in the long term for US politics. Just as overstating petty ideological or rhetorical differences can obscure a larger policy consensus, it is also important not to lump everyone on the right together. We chide those on the right who fail to understand differences between socialism and liberalism, and find it ludicrous when liberals refer to critics of the Democratic Party as the "alt-left." Similarly, we should understand the differences between the Never-Trump Republicans, the alt-right, "alt-light" and others within the Trumpist movement today. Hawley describes David Frum's attack on anti-war Republicans in the National Review in 2003 over intervention in Iraq as a key moment in the neocons' current position. At that time, some activists and thinkers on the left advocated strategic alliances with these exiled paleoconservative and libertarians because of their opposition to US intervention, regardless of disagreements on many other issues. The most obvious example of this lesser-evil alliance appeared at CounterPunch, which still regularly publishes pieces by both paleocons and libertarians. Beyond CounterPunch, other left media outlets promoted the website Antiwar.com, run by the Pat Buchanan and Murray Rothbard supporter Justin Raimondo. Thus, despite seeming to have become entirely marginal relative to the rest of the GOP, paleoconservative arguments remained at the center of American popular discussion through the anti-War and the anti-Patriot Act Movements. Ron Paul's two presidential campaigns contributed to this growing libertarian-left fusion. In addition to opposing US intervention and domestic surveillance, Paul's campaigns promoted anti-Federal Reserve conspiracy discourse in the wake of the financial crisis, providing a mainstream space for white nationalist organizing, as these groups pushed the narrative of the 2008 collapse from “Wall Street banksters” toward conspiracy theories about “Jewish bankers” and “global elites.” In the Bush era, the mingling of right and left activists in movement spaces became obvious in the growth in the popularity of the "9/11 truth movement," conspiracy theorist huckster Alex Jones, bizarre anti-Federal Reserve documentaries, as well as in smaller ways, as in the emphasis on buying local and the increase of leftists involved in anti-vaccine and anti-GMO activism. The decline in status of neoconservatives as a result of the debacle of the Iraq war and the associated domestic surveillance program was a crucial element in the growth of the Tea Party movement that gave us first, Sarah Palin, and then Donald Trump. Trump marked himself as different from neoconservative Republicans during the primaries because of his claim to have been against the war in 2003. In the general election, rather than shifting to the center as predicted, he relied on Steve Bannon’s populist attack on Hillary Clinton’s ties to Goldman Sachs, and today, continues to appeal to conspiracy theories about the "deep state" to dismiss stories of Russian hacking of the Clinton Campaign/DNC. (Journalist Joshua Green has made a point both online and in print of how important Bannon’s Clinton Cash was to the characterization of Hillary Clinton as “Crooked Hillary.”) The Democrats' attempts to appeal to what they perceive as widespread patriotic support for the "intelligence community" against Trump only plays into the fusion of libertarianism, paleoconservatism and some strands of the left. Activists who later helped to found Three Way Fight warned of the dangers of any temporary alliances with economic nationalists during the “Battle of Seattle” in the 1999 Anti-Globalization movement in My Enemy's Enemy and Confronting Fascism. Today, the danger of fusing left and right populism appears much stronger because of the added international dimension as well as the new media environment. Now, those who ignored this worry and allied with paleocons and libertarians describe the Never-Trumpers to be acting entirely in bad faith. In doing so, they ignore what Hawley explains has been a long-term transformation in the boundaries of acceptable conservative discourse, as neocons rejected overt racism and exiled the conspiratorial right from respectability. In this way, the neoconservatives can be understood as serving a similar centrist function in silencing and coopting right wing opponents just as the neoliberals of the Democratic Party have marginalized the left. In the meantime, courting those remnants to the right of the neocons has not led to any left victories, and from the perspective of larger dynamics, has added the voice of the left to the far right's argument that the Democratic center is in fact the greater, rather than the lesser evil. Slavoj Zizek took this logic furthest when he argued that Sanders supporters should seek to organize Bannon supporters for a joint fight against global capitalism. There is no current central representative of left opinion, but representative centers of gravity are the DSA/Bernie activists; Black Lives Matter, and the Women's March, though all these groups may at times accuse the others of being in alliance with one of the other two power blocs. The failure of the left to organize across cultural and sectarian boundaries within the US was exemplified in the contribution by some well-placed left media figures to articles about campus activists in 2015 that fueled a national moral panic about free speech on college campuses. These attacks on intolerant campus leftists ultimately fed Trump's support -- even as figures on the alt-right were playing up the same campus conflicts. What appears currently to be the most dangerous formation on the left is the long-term result of what was initially described as a temporary strategic, issue-specific alliance between the anti-war left with libertarians and paleoconservatives, who have in the last several years been actively courted by the Russian state, as conservative journalist James Kirchik has chronicled. The recent investigations by CounterPunch of the personas “Alice Donovan” and “Sophie Mangal,” whose attack pieces on the Syrian opposition and praise for Bashar Al-Assad were published by both left- and right-leaning media outlets, indicates the extent to which the left is vulnerable to the same courtship when it fits their existing biases. CounterPunch had the decency to admit that they had been played by a foreign intelligence service. Those on the left who continue to dismiss all mention of Russian intelligence efforts in the US, whether they target left media or elections as "McCarthyism," fail to understand the ideological connections of international right-wing populist movements. 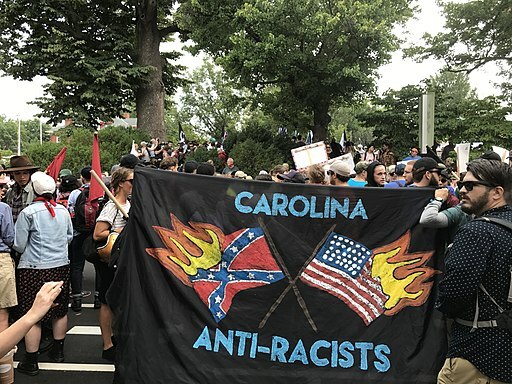 It is not a “made up” story that alt-right activists chanted “Russia is our Friend” in a recent Charlottesviille march, or that Eurasianist ideologue Aleksander Dugin is often featured on Richard Spencer's website, or that Pat Buchanan has claimed Putin for the paleoconservative cause. If the far right loves Putin for his authoritarianism, "traditionalism" and nationalism, some on the left continue to follow Russian media because they like the criticism of US intervention and buy uncritically the description of all the regime's opponents as fascists or the product of CIA manipulation. In a few notable cases, leftists have spoken about the Russian government offers of material support to struggling left organizations, as Micah White did in the Guardian. The most extreme exemplar of left-right fusion connected to the influence of Russia in US left politics is the current public support for Vladimir Putin by former Workers World Party activist Caleb Maupin, who has praised Putin on Sputnik as similar to both Abraham Lincoln and Franklin Roosevelt. But the more widely known figure supported by left-right alliance is Julian Assange, whose supporters on the left continue to overlook his overt statements of racism and sexism on social media because of their alliance with his position relative to the US security state. While the Democratic Party is certainly largely responsible for the current situation, this exclusive focus on the wrongdoing of the DNC by some on the left minimizes the meaningful threat of the populist and white-nationalist right within the conservative movement, including longer term GOP projects of racial gerrymandering and voter suppression. This particular part of the left is much too sanguine about the hegemony of the multicultural neoliberal order. The contradictory nature of this position is apparent in the treatment of near-wins by Corbyn or Sanders as harbingers of neoliberalism's near death, in combination with the surprise with which this faction has greeted Brexit, Trump's election, and each sickening right-wing turn, such as the seating of large numbers of right-wing parties in European parliaments. No matter how often they come, right-wing populist victories are treated as "aberrations" and "flukes" that will be corrected and controlled by the centrist power bloc. Meanwhile, we are to believe, the real danger to the left comes from the writing of Black progressive Ta-Nehisi Coates. The mistaken theory has been that the centrist power bloc would never compromise with the Trump-Bannon side of the right wing, largely based on an understanding of the US deep state as inherently neoliberal, and by a mapping of European party dynamics from the 1930s onto the US in the 2010s. Despite the continuing evidence that their predictions have been entirely mistaken, these left opinion makers continue to deny that Trumpism represents a serious break in hegemonic influence of the political center, even as they anticipate its imminent overthrow by the Sanders/DSA current. However, elements of the security establishment in the US are themselves divided and partisan, and it is not at all clear that these forces are universally neoliberal. Indeed, it is common for some anti-interventionist media to feature ex-intelligence operatives or intellectuals whose opposition to US intervention was or is currently based in paleoconservatism. It's also worth noting that the behavior of US political parties is different from those in 1930s Europe precisely because of the all-or-nothing stakes of the US election system. As a result, we have in the US neoconservative Republicans who may be horrified by Trumpean rhetoric, and yet continue to make compromises for the sake of the party's long-term survival, which they believe is seriously threatened by the demographic changes in the US. Among the dynamics that these critics of anti-Trumpist resistance fail to understand is the entryist strategy of the white nationalist right into youth groups through College Republican and libertarian organizations, a strategy that may have long-term impact on both the current structure of universities, and the center of political gravity within the GOP itself. The left understands that the parties are themselves powerful institutions with massive material assets. Keeping control of the electoral apparatus and retaining political bases in their support has become a desperate struggle that will lead to all manner of moral compromise and self-justification by neoconservatives with Trumpism, as we have already seen with the recent tax bill. Even Steve Bannon’s recent fall from grace was about personal disloyalty to Trump and failure to deliver electoral results, rather than a moral repudiation of his putrid ideology. The liberal welcoming of neoconservatives to the "resistance" against Trump is of course also short-sighted, and will likely result in the continuing rightward slide of the center. The most feared outcome of the current tactics of the #Resistance for the left is that, just as with the opposition to the Iraq War, engaging with the current mass resistance to Trump will produce more of the same: the sidelining of genuine left opposition as "wanting a free pony," while continuing to cede all populist ground to the right. This dynamic has ever been the danger of popular fronts. However, as I hope I have explained above, the anti-anti-Trump position comes with equally problematic entanglements. Rather than continuing to play this game, we on the left would do well to think about how our own divisions continue to push us into alliances with what we perceive as less evil but stronger forces from the center (for progressives focused on domestic inequality) or the isolationist/Russophilic right (for the anti-interventionists). Rather than seeking among our opponents for strategic allies, it would be much better to think in the long term, seeking a principled alliance across the left to create a strong center of gravity from which to fight both the center and the right. Anti-Fascist Forum, ed. My Enemy's Enemy: essays on globalization, fascism and the struggle against capitalism. Montreal: Kersplebedeb Publishing, 2003. Berlet, Chip. “Ron Paul’s Web of Denial,” Research for Progress (website), undated, http://www.researchforprogress.us/concepts/conspiracism/paul/denial.html. Dionne, E.J., Jr., et al. One Nation After Trump: A Guide for the Perplexed, the Disiullsioned, the Desperate and the Not-Yet Deported. New York: St. Martin's Press, 2017. Fekete, Liz. "Neoliberalism and Popular Racism: The Shifting Shape of the European Right." In The Politics of the Right, Socialist Register. London: Merlin Press, 2016. Green, Joshua. Devil’s Bargain: Steve Bannon, Donald Trump, and the Storming of the Presidency. New York: Penguin, 2017. Hamerquist, Don, et al. Confronting Fascism: Discussion Documents for a Militant Movement. 2d. ed. Montreal, Quebec: Kersplebedeb Publishing, 2017 (first published 2002). Hawley, George. Making Sense of the Alt-Right. New York: Columbia University Press, 2017. ---. Right Critics of American Conservatism. Lawrence: University of Kansas Press, 2016. Miller, Edward H. Nut Country: Right Wing Dallas and the Birth of the Southern Strategy. Chicago: Chicago University Press, 2015. 1. 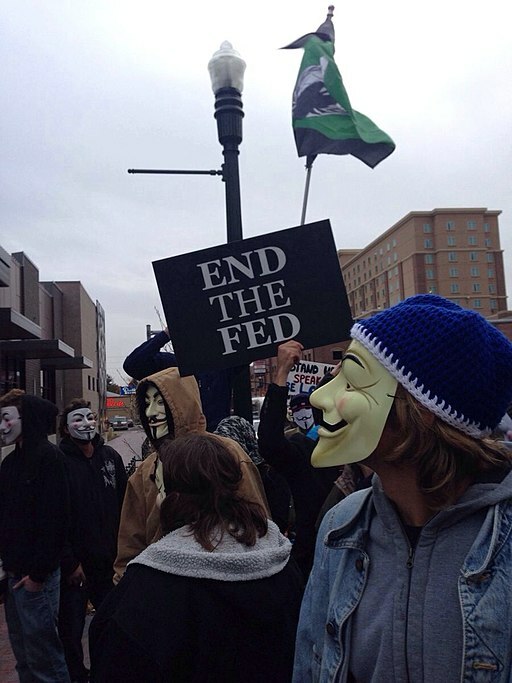 Million Mask March, Boise Idaho, 5 November 2013. Photo by User:Bastolio (Own work) [CC BY-SA 3.0], via Wikimedia Commons. 2. Screenshot of Julian Assange tweet, 8 August 2017, 1:16 a.m.
3. Banner by Carolina Anti-Racists protesting Charlottesville "Unite the Right" rally, 12 August 2017. Photo by Anthony Crider [CC BY 2.0], via Wikimedia Commons. H-Net has published my review of political scientist George Hawley’s book Making Sense of the Alt-Right. On the plus side, the book is carefully researched and offers a good account of the alt-right’s development, hostility to conservatism, distinctive online tactics, and relationship with the Trump presidential campaign. On the minus side, it offers little new information or analysis, neglects crucial features of the alt-right (such as its gender politics and its relationship with the European New Right), and takes gratuitous and ill-informed swipes at antifa. "Hawley’s examination of the Alt-Right’s relationship with mainstream conservatism is one of the book’s particular strengths. As he emphasizes, the Alt-Right is not just a racist version of conservatism but rather rejects the conservative movement’s main premises, 'the so-called three-legged stool of moral traditionalism, economic liberty, and strong national defense' (p. 4). This attack on conservatism grows out of the Alt-Right’s rejection of classical Enlightenment principles, such as liberty and equality, and also many Alt-Rightists’ hostility to politicized Christianity. Hawley argues that while many conservatives are bitterly opposed to the Alt-Right they are unlikely to defeat it, because of their own movement’s current weakness, the rise of numerous right-wing websites beyond conservatives’ control, and the fact that Alt-Rightists are not interested in 'a seat at the conservative table'; they simply want to destroy it (p. 113)." "Hawley’s portrait of the Alt-Right is well researched and carefully argued. However, almost all of what he presents has been well covered before by news organs or antifascist researchers. Hawley’s book gives this analysis the imprimatur of a professional academic and the benefit of fresh interviews with a number of Alt-Right activists, such as Richard Spencer, Greg Johnson, Jared Taylor, and Lawrence Murray. Yet I had hoped Hawley would do more to put the Alt-Right in a broader political context. For example, the movement’s profound debt to the ENR [European New Right] and engagement with ENR figures—Alain de Benoist, Guillaume Faye, and Aleksandr Dugin—deserves much more attention than it receives. I also wish that Hawley had probed more deeply into some of the issues he touches on only in passing, for example, the pivotal role that anti-Jewish scapegoating plays in white nationalist ideology, the Alt-Right’s discussions of foreign policy, or its debates around homosexuality or abortion. Exploration of these topics would have given a fuller picture of the movement’s inner dynamics, political philosophies, and interplay with other far-right currents."